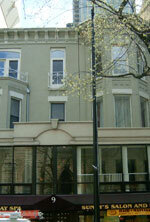 9 E. Superior is a 4-unit brownstone walk up located in the heart of the Gold Coast. Most of Chicago's leading restaurants, galleries, and shopping are within a 10-minute walk. All the apartments are completely remodeled with high ceilings and condo quality finishes including new kitchens. Residents also enjoy outstanding views and parking in the rear of the building.